WWT allows students to change their point of observation in order to see parallax using familiar constellations. Students use campus objects to measure parallax in a terrestrial environment. 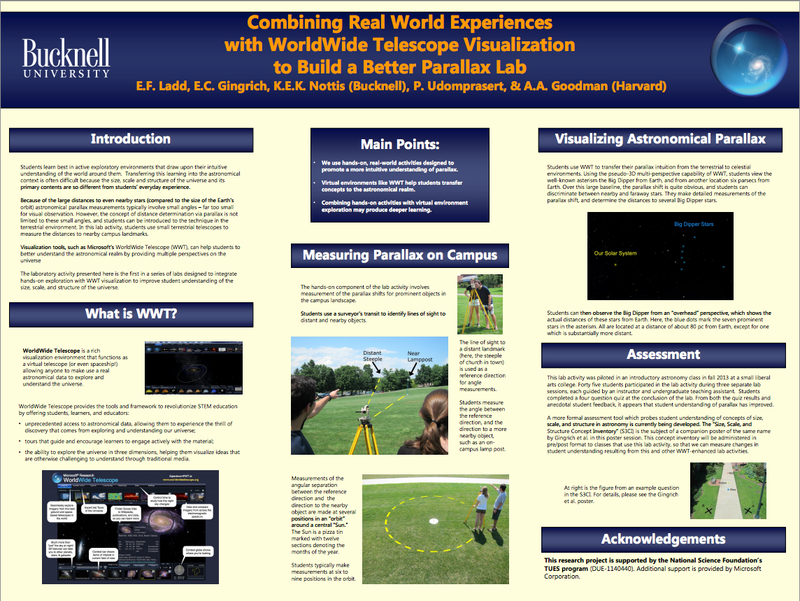 Bucknell professors Ned Ladd and Katharyn Nottis, in collaboration with the WWTA team, have created and tested new curricular materials that integrate WorldWide Telescope (WWT) into hands-on laboratory programs in undergraduate general education astronomy courses. The new lab materials are designed to address and alter student misconceptions regarding size, scale, and structure in the universe. allow students to investigate the essential ways astronomers measure distance in our universe in an interactive 3-D visualization environment with real astronomical data. This multi-perspective visualization of inherently 3-D astronomical structures produces a much more intuitive view than can static 2-D diagrams in traditional curricular materials. Students can compare their own conceptions of size, scale, and structure with evidence-based maps, and develop a more accurate mental model for their celestial surroundings. and that lab will be made available here after it has been tested more extensively in Bucknell classrooms. The team has also developed a new concept inventory to measure gains in the student understanding about the topics covered in these lab activities. The "Size, Scale, and Structure Concept Inventory (S3CI)" is a multiple-choice assessment containing 24 questions designed to probe students' understanding of size, scale, and structure. Previously, no concept inventories focused exclusively on these geometrical ideas, so our team developed the S3CI to address this need. A first version of the S3CI was administered to Bucknell students in the fall semester of 2013. Based on student responses, the team revised the concept inventory by changing the language on some questions, deleting one question, and adding another. A poster describing this work was presented at the Astronomical Society of the Pacific's Annual meeting in August 2014. V2.0 of the S3CI is now available for additional testing and evaluation. It has been coded into an online format using Qualtrics survey software, and can be administered over the web. Introductory astronomy instructors interested in helping to evaluate this concept inventory by administering it to their undergraduate classes should contact Professor Ned Ladd. These hands-on lab activities are designed to be usable in a wide variety of academic environments, at relatively low cost. The curricular materials have been shown to be effective in reducing student misconceptions. We have made them freely available, along with associated documentation, to the Astronomy 101 teaching community on this website. WWT is also freely available and runs on virtually any PC, so instructors at a wide range of institutions can make use of these resources. This research is funded by the National Science Foundation (DUE-1140440).